Christmas is time a time of gift-giving and we all know what that means for us moms. Yes, you got it right... shopping! Don't you just love shopping for great finds in bazaars at this season? Our personal favorite is, of course, the Mommy Mundo Bazaar! 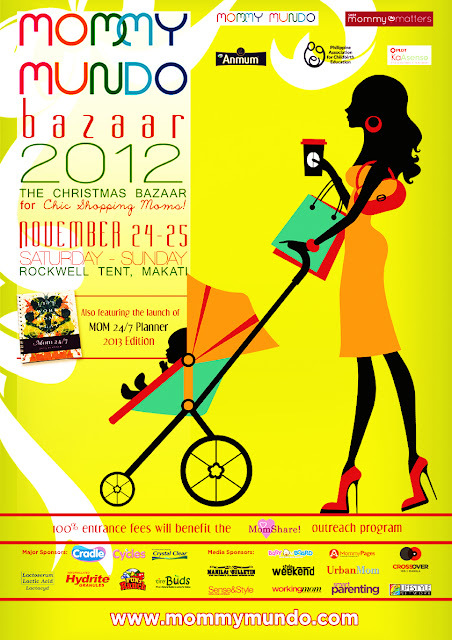 Mommy Mundo Bazaar 2012 is finally happening on November 24 and 25 (Saturday and Sunday) at the Rockwell Tent, Makati City. Entrance fee is only 30 pesos per person and all proceeds from the entrance fees will go to the Christmas outreach project of MomShare. Moms like me love the Mommy Mundo Bazaar because everything sold here are for mom and kid-friendly. Expect going around over 80 booths featuring the latest mom and baby products, gift items, toys, clothes and shoes, and books among others. This event is not only for moms but for the whole family as well. There's a photo booth where you can have your family photo taken for free. Kids can also have a grand time playing at the Fun Ranch play area while mom is shopping. Of course, the devoted daddies will leave their leather briefcases at home and carry the shopping bags, hihihi! This big event will also be the launch of the 2013 edition of the Mom 24/7 Planner (more details of the planner in a separate post) so be sure not to miss it!